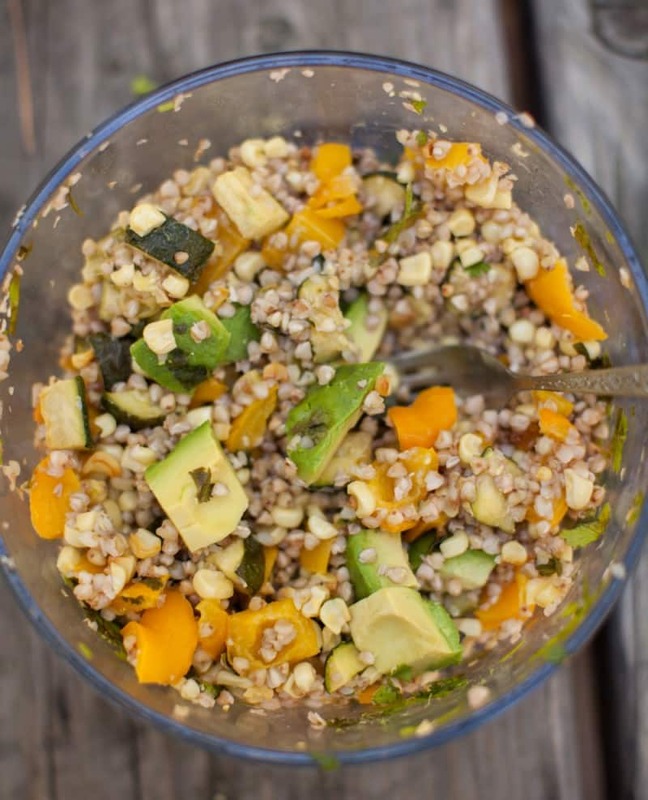 This buckwheat salad was part of a picnic spread we packed for a short trip up to Lake Tahoe. If you’ve never cooked with buckwheat, it can be a bit finicky as some different varieties of buckwheat/kasha cook up into a pile of mush (good for a porridge base, not for salad). My preferred method/technique come from Martha Rose Shulman. It’s a bit different but the end result is more predictable. Preheat oven to 400˚. Dice zucchini and peppers into bite size pieces and remove corn from cob. Toss zucchini, peppers, and corn together with olive oil, salt, and pepper. Roast for 20-30 minutes until tender and beginning to brown. Combine roasted vegetables, cooked buckwheat, cubed avocado, and goat cheese, if using. Whisk together lime juice and honey, drizzle over salad. Add in cilantro and toss everything together. I find that when making a buckwheat salad, it’s important to account for the taste of buckwheat. 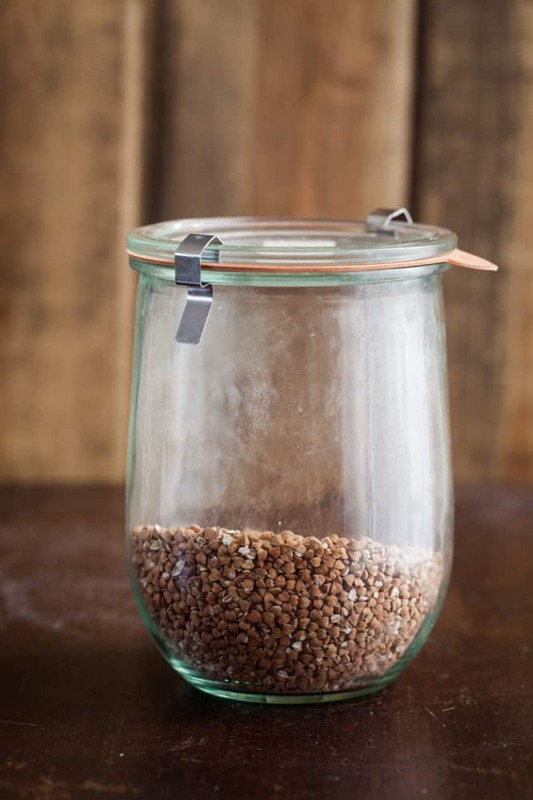 The flavor of buckwheat is really earthy and isn’t like any other grain. While it can be overwhelming, it can also work really well with other flavors (like the roasted vegetables in this salad). Grains: If you’re not in the mood to try out buckwheat, quinoa or millet would be my next grains of choice since they both cook up rather quickly. Vegan: Leave out the cheese and honey (or use your favorite sweetener). The flavors of this salad are all about the roasted veg and grain, less so about the cheese. Cheese: I like the goat cheese with the kasha but feta would also work. Buckwheat (the raw version) and Kasha (the toasted version) usually end up in my kitchen as flour. The earthy, slightly nutty flavor works really well in pancakes and crepes. I don’t use the whole grain as often but it’s really lovely for a simple breakfast porridge a salad, such as this one. nice post. Funny how a little over a month ago we walked through the same park. There were more bears than people. Tahoe is an amazing area. I can not wait to get back there. And Yosemite….. Such a great summer picnic salad! The roasted zucchini + corn sounds perfect! Some of my favorite foods! I absolutely love that tree picture next to the pine cone. What an neat angle and perspective! I am exactly the same way. PS you live in a dream land. that tree! this looks like the most perfect place for a picnic and to forget about troubles! I especially love the tree picture. This looks fantastic! I am a huge buckwheat fan, after being introduced to it while living in Ukraine. Cheap, healthy, delicious. My kind of salad! Love it! And yay for the mountains! Oh yes, I know that feeling. Beautiful! This looks delicious! Also, is that Sugar Pine State Park?! We’re camping there this coming weekend! I feel like when I’m super stressed I end up just laying around doing nothing all day so your strategy sounds so much more lovely. This salad sounds amazing…totally my kind of summer fare! I haven’t driven up there for a while. It’s such a beautiful drive, and once you get up there, gorgeous. That bowl of salad looks delicious. Lime and honey, nice! That is a seriously gorgeous salad! Wow, we have so much in common! Even me, my hubby and kids would love to run away from the daily monotony and stress to a quiet place and have picnic there or just spend some time with each other! 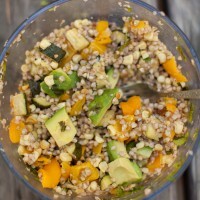 Lovely and healthy buckwheat salad recipe. I made this tonight, with barley instead of buckwheat because I didn’t have any. I also omitted the honey. IT WAS FANTASTIC! Highly recommended. Question: Do you think this could work with quinoa? Hey Natalia, Sorry for the delayed response- I think quinoa would be lovely!